Joensuu is a city and municipality in North Karelia in the province of Eastern Finland. Satisfy your inner culture vulture at Lusto - The Finnish Forest Museum and Savonlinna Provincial Museum. 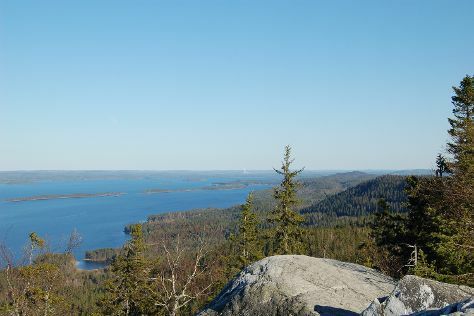 Get outdoors at Patvinsuon Kansallispuisto and Ukko-Koli Hill. Get out of town with these interesting Joensuu side-trips: Koli National Park (Uhrihalkeama, Kolinuuron kierros Nature Trail, & more), Kerimaki Church (in Kerimaki) and Savonlinna (Olavinlinna Castle, Savonlinna Cathedral, & more). Spend the 7th (Sun) exploring nature at Linnansaari National Park. There's still lots to do: look for all kinds of wild species at Era Eero, see the interesting displays at Pohjois-Karjalan museo Hilma, explore the activities along Siikalahti Wetland, and don't miss a visit to Sculpture Susi Kosiomatkalla. To see reviews, traveler tips, ratings, and other tourist information, read our Joensuu trip itinerary builder tool . Expect a daytime high around 6°C in April, and nighttime lows around -2°C. Finish your sightseeing early on the 8th (Mon) to allow enough time to travel back home.